Northeast Rubber, a Division of Niantic Seal Performance Materials group, is a custom fabricator and distributor of metal and rubber hose assembly products. Northeast Rubber is also a specialty distributor for rubber hose, Teflon hose, ducting hose, hose accessories and tubing from the world’s leading manufacturers. Our expertise is in hose assembly, custom fabricated hoses, and related products and services. 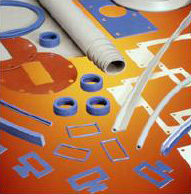 Northeast Rubber, has been designing and fabricating custom metal hose assemblies for over 35 years. Every welder is certified to Section IX of the ASME Boiler and Pressure Vessel Code.